The SunRISE TechBridge Challenge to Realize Innovation in Solar Energy is seeking innovations in materials and technologies that will reduce the cost of energy for photovoltaic (PV) systems, and consequently increase the penetration of affordable PV. Solar energy has become an important source in the global energy mix over the past decade. For solar energy to reach grid parity and become cost competitive with fossil fuel-based generation on a global scale, it is necessary to lower the levelized cost of energy (LCOE) of solar PV. Potential venture funding from DSM. 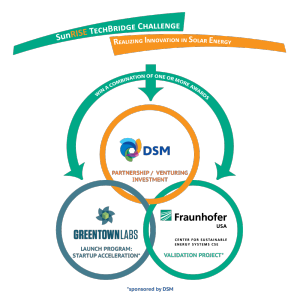 The SunRISE TechBridge Challenge is presented by Fraunhofer TechBridge in partnership with DSM, a global, science-based company active in health, nutrition and materials, which is building a young and fast-growing business in solar, and Greentown Labs, the largest cleantech incubator in the United States. Applications close March 16th, 2016—apply at www.FhTechBridgeChallenge.org/SunRISE. Launched at Fraunhofer CSE in 2010, the Fraunhofer TechBridge program identifies and de-risks promising technologies to solve industry challenges. By performing targeted technical searches and conducting validation and demonstration work, TechBridge evaluates and prepares innovative early-stage products for investors and industry. See www.cse.fraunhofer.org/techbridge for more information.